After years of working as a counselor, I’ve seen couples in all stages, and I am always intrigued by what makes a marriage work. How do couples overcome messy childhoods, unhealthy habits, and constant conflict to have a strong, healthy marriage? 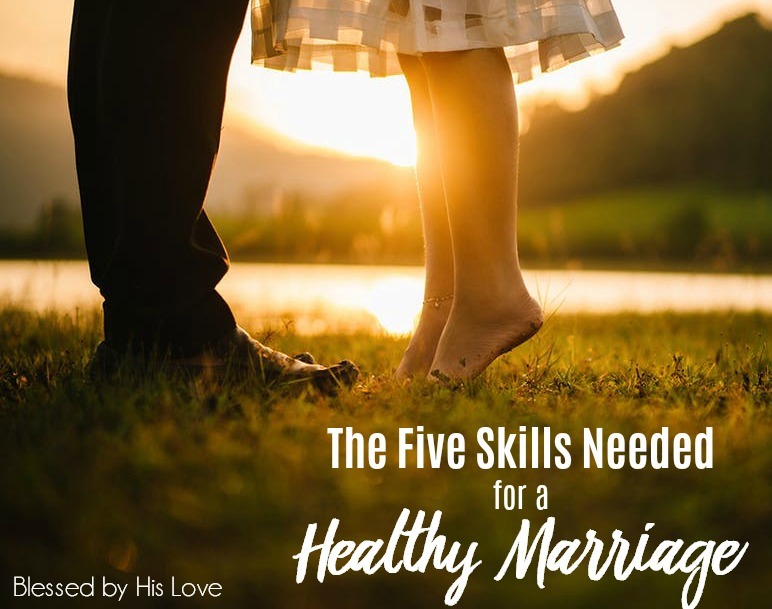 What skills or characteristics do we need as spouses to work towards the marriage that God designed for us? There are many important elements, but with God at the center, here are five skills that I believe are needed for a healthy marriage. *My caveat is that none of these should be used to justify abusive behaviors in a marriage. God does not call us to have abusive, selfish marriages. If you are experiencing high levels of conflict or emotional or physical abuse in your marriage, please seek help from a trained professional. 1. Humility. Throughout the Bible, humility is a consistent theme. Ephesians 4:2 tells us to, “Be completely humble and gentle; be patient, bearing with one another in love.” James 3:13 says, “Who is wise and understanding among you? Let them show it by their good life, by deeds done in the humility that comes from wisdom,” and 1 Peter 3:8 tells us, “Finally, all of you, be like-minded, be sympathetic, love one another, be compassionate and humble.” In Matthew 5:5, Jesus taught that “God blesses those who are humble, for they will inherit the whole earth” (NLT). Although most Christians would tell you humility is important, we often become so focused on being “right” or “winning” arguments that we become arrogant and unkind towards our spouses. We justify being patronizing or nitpicking because we are determined to prove that we are right and they are wrong. It is always interesting when I ask couples about conflicts they’ve had and how they resolved it. Even if it’s been weeks (or years!) since the argument, unhealthy couples will continue to point at their spouses and say, “Yes, I yelled, but he/she said this,” or “Sure, I made a mistake, but look how badly he/she treated me.” It takes humility to take responsibility and apologize first, to realize that we are as flawed as our spouses, and acknowledge that attacking our spouse to win an argument is never okay. To truly resolve conflict, each partner has to take responsibility for their actions and identify ways they can improve their own behaviors in the future. If you are more focused on pointing out what your partner did wrong, then it will be difficult for you to have a healthy marriage. I have had couples work through addiction, affairs, and high levels of conflict. The ones who are the most successful are the ones who wake up every morning committed to being gracious and humble towards their spouses. 2. Flexibility. Rigidity will destroy a marriage over time. If you or your spouse are constantly focused on how things should be or how he/she should act or should look, eventually, it will drive you apart. I’ve worked with couples have been married for decades and are still arguing over a statement one of them made ten years ago (“But remember that one fight? You said that you would be one who takes out the trash.”). 1 Corinthians 13:5 tells us that love "...is not easily angered, it keeps no records of wrongs." When couples lack flexibility, they keep getting stuck on the same arguments and fights because they are hung up on how their partner should have handled things or should be treating them instead of reevaluating the situation and moving forward. While it appropriate to have standards in a relationship, overly rigid expectations are not healthy. Over the years, you will deal with many situations that require flexibility: a cancer diagnosis, the passing of parents, lost jobs or an unplanned job transfer. Flexibility enables us to change our plans, expectations or behaviors in the face of unexpected situations and roll with life’s punches, instead of spending years arguing about what the other person should have done differently. 3. Willingness to try new things. I’m always wary when people say, “He never tries new foods” or “She always goes to the same restaurant.” While routine can be comforting, especially for those with chaotic childhoods, a willingness to branch out and try new things allows a relationship to grow and develop. When my husband and I were young (before kids), we tried different restaurants, traveled to new places, and tried different types of dates – movies, frisbee golf (which I was terrible at), outdoor activities, and different hiking trails. Now that we’ve been married for 15 years, our lives have settled into more of a routine, but we still make an effort to try new recipes at home, experiment with different hobbies, and volunteer in different settings. If you or your spouse aren’t willing to try different things, you can get so stuck in a routine that you no longer have things to do or talk about. However, a willingness to try new things isn’t just related to dates and experiences. It is also about the capacity to embrace new situations, places, and things. I had friends who were so resistant to trying new things that every “new” situation in their lives caused conflict. Everything from traveling to buying their first house became a source of contention, and ultimately, they divorced. Instead of viewing new experiences as a positive way to grow and learn about each other, change was perceived as something negative and became a barrier in their relationship. Life is full of new experiences as a couple: buying your first house, traveling, new careers and jobs, and having children. If you or your partner are unable to embrace those new experiences willingly, it can damage the relationship over time. 4. A Heart for Service. A friend once told me that the happiest place in a marriage is when two people are actively serving each other. Unfortunately, many couples become imbalanced in this area. One person feels entitled to be served by the other ("I'm working hard and she's not," "He just doesn't understand that I'm always tired"), and while one person may be okay always serving their spouse initially, this can breed resentment if it continues for years. Service in a marriage must go both ways. We are all called to serve each other. Galatians 5:13 tells us, “…but do not use your freedom to indulge the flesh; rather, serve one another humbly in love” (NIV) and 1 Peter 4:10 reminds us that, “Each of you should use whatever gift you have received to serve others, as faithful stewards of God’s grace in its various forms” (NIV). If you are feeling stagnant in your relationship, ask yourself: am I serving my spouse or expecting them to do everything? Over the years, I’ve noticed a decrease in our marital satisfaction when my husband or I become complacent and expect our partner to do all the work. Learning to serve each other must be a mutual goal. This means if your spouse asks you how they can help, give them ideas! Sometimes I see couples where the husband wants to serve the wife, but in her effort to be a supermom, she refuses to let him help her. Or the wife wants to serve the husband, but he is so focused on not looking weak, that he won't allow her to help him. Helping each other and working as a team is a great way to build better communication and intimacy. 5. Introspection. Healthy couples often have good introspection, which simply is the ability to look inward and be aware of your internal motivations, background, and expectations. Think of times your child does something wrong. When you ask them why, would you rather have them sullenly say, “I don’t know” or respond with, “I did it because I was mad about _______”? When your child is willing to talk about their feelings and motivations, you can have a discussion about what went wrong and how to fix it in the future. It is having the capacity to say, “I’m sorry, let’s figure out a better way to do this,” or “I'm sorry I've been irritable. It’s been rough at work and I’m taking it out on you, which isn’t okay.” Introspection is not innate for many people, but it can be developed over time and makes resolving conflict easier. All five of these skills are needed for a healthy relationship. However, do not expect your partner to demonstrate them 100% of the time, but be unwilling to use them yourself. If you find yourself being rigid, struggling with humility or lacking introspection, seek help. Sometimes just meeting with a counselor or pastor to work through your issues – a traumatic childhood, insecurity or limited introspection – can allow you to grow and become a better spouse. If you are working diligently and changing, but your partner is still struggling, a few sessions of marriage counseling or guidance from a pastor can be beneficial. The beautiful thing about marriage is that it should always be growing and improving, and although it may be difficult to develop these skills, it is worth the hard work. You will begin to experience a greater intimacy with your partner and move towards the marriage that God designed for you. With only ten months of marriage under my belt, I can use all the wisdom you've got! Thanks! I agree with the importance of humility. Even with our relationship with God, it's of utmost importance that we recognize our shortcomings. Pride is often the main thing that hinders us from uniting more intimately with those we love. Thank you for these! My husband and I have benefited a great deal from a counselor's advice in the past, and these are good reminders. What's hard for me is knowing what you're doing wrong and trying to fix it, but just repeatedly failing, no matter the intentions. I'm glad my husband has grace! I definitely need God's help!